LH rear door panel shown; RH similar. Remove the rear door window run rubber. 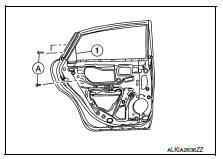 Remove bolts (A) and rear door glass rear run channel (1). 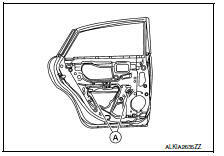 Remove the rear door glass to regulator bolts (A). Remove the rear door glass. After installation inspect and adjust as necessary. Lower the glass slightly [approx. 10 to 20 mm (0.4 to 0.8 in)], and make sure the clearance to the sash is parallel. If the clearance between the glass and sash is not parallel, loosen the regulator mounting bolts, guide rail mounting bolts, and glass and carrier plate mounting bolts to correct the glass position.